This is for the advanced only, not a company that is still trying to answer “what or why”. To gauge the sophistication of your organization, see this chart. Deploying this strategy without grasping the foundations of social media, the cultural changes it implies or testing trial programs will likely lead to failure. You’re responsible for the direction of your online strategies for your company or organization, specifically using social media and computing tools to reach, connect, and build communities around your brand. Most folks at your company know this space is important, but don’t know how to do it, they are relying on your expertise to think holistically, integrated, and strategically. If you’ve not already figured it out, the corporate website is becoming less relevant, and web marketing (and support) has spread off your domain and google results. You also know that prospects trust the opinions of existing customers (who are ‘like them’) far more than marketers, as these communities of practice assemble, your brand is decentralized –embrace! How did I learn this strategy? First or second hand experience. I first learned about this from watching Robert Scoble and the famous Origami launch, a product that was deployed using many of these phases (although I’ve not heard of much of the product since) I then deployed this at Hitachi Data Systems (Shel has the story) for a few product announcements, they were smaller, but effective. Lastly, as the Director of Corporate Media Strategy at PodTech my primary purpose was to advise clients on these strategies. This strategy has been in my head for over 2 years. Tactics include: Creating a feedreader, and subscribing to feeds in your market, using a social media measurement vendor (see this list of companies), create an internal Air Traffic Tower, talk to customers, review support forums, (on your site or elsewhere) and find anecdotes from blogs showing market need. These ‘needs’ and problems that customers state they have will then be used in part 2 and 3. Marketers want everything to go “viral” (what I call velocity) but often fail to realize that by involving the community is one of the most effective ways in encouraging velocity. Engaging in conversations both public and private (embargo) gives ownership to the community. By using step 1 to understand members who have expressed pain in the market, those are likely candidates for involving in these discussions. Show them that you’ve listened to them, and you want them to be part of the solution and eventually the announcement and product. Tactics include: Conversing with those in the market through comments, email, and other means, involving them. Example: I was a customer of Factiva (Dow Jones), I was using their Insight product, but found several flaws, I blogged it, they engaged, and they started to include me to lead a roundtable, product feedback, and eventually write a white paper with them. Also, many companies involve bloggers in an embargo, as they would want to break the news first and early. Treat bloggers, podcasters, and the like just as you would press and media. This is where all cylinders fire together, collectively, and holistically. Depending on your tool set, all blogging, twittering, Facebook, media, and traditional marketing engines need to focus at the same time. The goal? Get the attention and trigger a discussion. Many of the tools should point to a single product blog or product webpage. The worst thing you could do? Link to a static press release. Press Releases don’t inspire and are designed to give information –not encourage dialogue or interaction. instead, point to your lead blogger, who could link to the press release and who will then introduce the product team, where there should be media to trigger a discussion, and let users ask questions in forums. Communications should let the market know that the product team is standing by to answer questions, and will be proactive, their waiting in the ‘conversation booth’. Tactics include: Understanding how to ‘drop pebbles‘, using an integrated web approach, and engaging one’s community, overlays for events, use tools in a holistic method. Get familiar with the many forms of web marketing. This is where most social media strategies stop, but in fact, it’s where it should just start. At the BANG! the lead blogger or teams will point to the product group. The product group must be ready to stand by and ask questions in comments or forums. I’ve noticed the successful strategies will include media as a lead in, a video tour, demo, or audio podcast that provides a very human element. Many of the people who come to the product area will not stay, and that’s expected, this is the slide down the narrow funnel. Tactics include: Product blog, Product forums, Media in the forms of Video, Audio podcast, animation. Product Managers will be using listening tools (section 1) to respond and converse with the market. Tactics include: Continue communication between product teams and customers. Encourage customers to take an active role in deploying products and promoting to prospects. Tools such as blogs, forums, and wikis will foundational. Enhance with an ongoing media series such as video or audio podcasts around best practices of product usage. Encourage customers to create their own media and promote in community. Strategic blogging comparing your product to competitors keep your brand relevant and ‘in the conversation’. Here’s where the real growing happens, as a thriving community around a product starts to assemble, while many customers never participate a small active group will contribute, and a slightly larger group will occasionally comment. The savvy product team will encourage users to self support each other, why? They collectively know more about the products than the product team. Lastly, there are cost benefits for customers to self-supporting, as well as research information. Tactics include: Creating an online community platform that encourages customers to self support each other, and for product teams to learn, and help as needed. I deployed the HDS user forums at 4 dollars a week, it’s still thriving today. I setup a global team to watch the forums, keeping out spammers and addressing and alerting product teams to any critical issues. Also remember that support has moved off the corporate domain, a distributed strategy is needed. Now the fun starts. By including customers in the product development process using social media communication tools, product teams have the opportunity to build a product right to spec. John Schwartz the CEO of Sun Microsystems was quoted saying that “Intranets are an anachronism, they’re going to die” and that product teams of the future will collaborate with customers in real-time to determine the product needs of the future. Giving customers a sense of ownership will also pay off as you develop customer advocates who are more likely to want to purchase a product they helped to input or build. Tactics include: Consider creating a voting or prioritizing feature, as it may be hard to justify weight of request on forums. See analysis of Dell’s IdeaStorm, which was also done at SalesForce and WebEx. Encourage customers to create a wiki, to support products, define future requirements. In person meetings, as well as reading what they say will continue to add datapoints. Every product gets replaced, it’s the law of innovation. As customers are now part of the design process of a product, they’re more likely to purchase the product. Done correctly this could reduce marketing and advertising costs as well as excess inventory. Take Threadless for example, where customers design and rate products. Only highly rated products are created (T-Shirts) and are quickly sold out –little inventory, design cost, or support. Tactics include: Encourage the voice of the customer to be as strong if not stronger in this phase. Customer References programs are being impacted by social media, so allow the positive (and negative) voices to be featured –you can’t stop it anyways. Reward customers who advocate your products, and engage those who detract, getting them involved, engaged, with a sense of ownership. There’s a variety of tools to use during this process. Tactics include: Use social media tools to encourage users to learn about new products, in many ways, elements of the first few steps to get the word out to existing customers should also be used in the customer forums. Media and real customer testimonial (positive and negative) may be most effective. Listening, conversing, and joining never end. The process to understand customers from their own natural and native voices will continue and the process will continue. 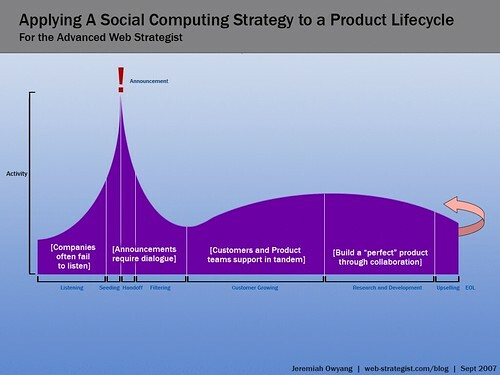 It’s my vision that social media is an overlay to all announcements, products, across and up and down the enterprise. Tactics include: Measuring success, self-awareness to continue to make the process more effective, and communicating internally. Limitations: Please note there are internal communication strategies that involve social computing and media, this article does not address those. Secondly, measurement should be a core component of the whole process. Was this helpful, leave a comment? For additional resources, please review all my posts tagged “Web Strategy“, there are multiple pages.